this week we will hear from molam saman hongsa & his fantastic group of isaan entertainers! saman, from ubon ratchathani, is one of the greats in the world of lam performers. he's known to some degree outside of thailand as the leader of the isan slété group, who recorded & toured through the u.k. in the late 80's. within thailand, however, he's probably best remembered for his string of comedy albums, one of which is presented here. 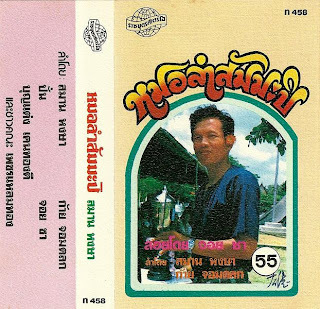 this tape is great, because to me it captures the feeling of a typical molam performance.. not strictly musical, but more like a variety show, with comedic skits and banter woven seamlessly between the songs. comedians from the phetlaemthong troupe (inculding "pan", "choi sa" & bunthaeng khenthongdi) jibe with the audience while molam saman & kai chomtalok engage in clever wordplay and skillful vocalizations. the band is great as well, phin & khaen, bass & drums, all ready to whip the audience into a dancing frenzy when the time comes. enjoy!